What is Your Least Favorite Movie By One of Your Favorite Directors? Partly inspired by last week’s question, I decided to ask today what’s your least favorite movie by one of your favorite directors? Sometimes even the best filmmakers have flubs. The most notable example for me would be David Lynch’s Dune. It’s been only recently since I’ve started watching Lynch’s work and I’ve immediately become a huge fan. In fact, I would say he’s one of the greatest directors of all time (in fact, after seeing Mulholland Drive in December I would put it in my top 5 films). Unfortunately, Dune was a pretty big mess, though to be fair Lynch didn’t have full control over the movie, plus he did do some interesting work with imagery. But what would you pick? of the top of my head, Tree of Life by Terrence Malick. I love everything he has ever done and this one was critically lauded but I just didn’t get this one, at his indulgent worst. I was part of the camp who loved The Tree of Life, but I do see your side. I do know a couple of other Malick fans who didn’t like the film either. Thanks for commenting. I would have to go with Hitchcock’s Marnie. I’m a real big fan of Hitch, but this movie was terrible. Adding in the fact that Sean Connery was in it, I had pretty high expectations. Unfortunately, Tippi Hedron came along and ruined the movie.She wasn’t the only problem with the film, but definitely the biggest one. There are a few other HItch films that I don’t like, but this is the only one I can actually say is bad. There are also a couple of Scorcese films that I didn’t like the first time around (Gangs of New York, Goodfellas), but I plan on watching them again and I’m hoping to change my opinion! I haven’t seen Marnie, though I do plan to get around with it as I’m hoping to see all of Hitchcock’s movies (though seeing his filmography that will take some time). Give GoodFellas another shot, that’s one of my favorites by Scorsese. Thanks for commenting. It would either be Kubrick ‘A Clockwork Orange’; although I wouldn’t necessarily put Kubrick in my list of favourites (top 10, that is), I have an especial hatred for that film. Another would be ‘Annie Hall’ by Woody Allen. Oh, I love A Clockwork Orange, it’s one of my favorites by Kubrick, though I do know why people don’t like it. I haven’t seen Annie Hall in some time, but I do remember enjoying it. Thanks for commenting. I totally agree about A Clockwork Orange, I really don’t like that film, though I can see perhaps what Kubrick was trying to do. I just don’t think it came off in that film. As I said before, I do love A Clockwork Orange, though I know why some people dislike it. Thanks for commenting. I knew that would get a shout out. Yeah, that was pretty bad, particularly with the aliens. Thanks for commenting. My least favorite film by a favorite director is Insomnia (2002) by Christopher Nolan. The 1997 Norwegian original, which I saw first, is superior to the remake in just about every way possible. First Stellan Skarsgard’s performance is much better than Pacino’s, as this is imo another one of Pacino’s hammy over-the-top performances. Whereas the original sticks to a murky morally unresolved ending, Nolan (unlike his other films), rejects ambiguity is favor of a typical Hollywood ending where the anti-hero has a death scene where he redeems himself. Hmm, I wasn’t crazy on Insomnia either. In fact, I don’t think I’ve finished the entire movie. Pacino’s performance definitely hurt the movie overall. Thanks for commenting. The Life Aquatic with Steve Zissou by Wes Anderson. It’s not really a bad movie, but it’s my least favorite by him. Even though I like The Life Aquatic more than most, I would probably say it’s Anderson’s weakest movie as well. Thanks for commenting. The Dark Knight Rises is Chris Nolan’s first movie that I didn’t like, though I’m debating whether or not I consider Nolan an actual favorite of mine, heh. In that case, I’ll go with Robert Rodriguez’s Machete. I haven’t actually seen his stuff aimed at kids, though I’ve heard bad things about most of them, too, but of his more adult oriented movies, Machete was the first time where I really think RR has lost his touch. I liked TDKR. I didn’t see Machete, but I feel RR’s latest films have been really watered down. Thanks for commenting. Yeah, I’m not a fan of Dune. I love the book though. I think I’d have to go with … man, I don’t know. If I go with Spielberg, I suppose I am not a big fan f JP2. I’d have to say Fight Club for Fincher, and Full Metal Jacket for Kubrick. Yeah, Dune was pretty bad. JP 2 was pretty disappointing and while I do like Fight Club, I think it’s overpraised. FMJ isn’t my favorite by Kubrick, but I do love it. Thanks for commenting. My least favorite Peckinpah film is Convoy. 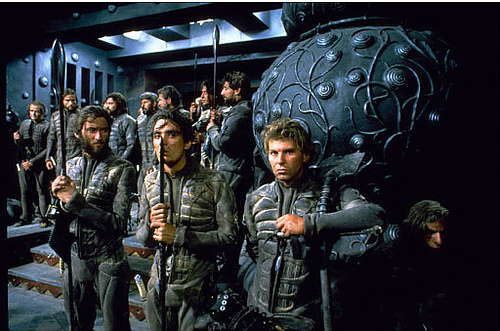 I probably owe Dune a rewatch, since I saw it before I got into Lynch’s work. Thanks for commenting. I haven’t seen that, but I did like Escape From NY. Thanks for commenting. Well… I don’t like to say least favorites but there are some filmmakers I do love that has made some stinkers. In Gus Van Sant, it’s a cross between his version of Psycho and Even Cowgirls Get the Blues. Both films are quite terrible as was his recent film Promised Land which I found to be heavy-handed and containing one lame twist at the end of the film. I like Gus Van Saint as well, but he’s made some pretty bad films. Thanks for commenting. I’d have to go with Stanley Kubrick and “Barry Lyndon”. The cinematography in natural light is outstanding. But the plot! God, I couldn’t stay with it. Oh, Barry Lyndon’s one of my all time favorite movies and is my second favorite Kubrick movie, though I know it’s slow for some people. Thanks for commenting. LOL. I guess I’m slow. That’s okay. My favorite SK will always be Full Metal Jacket. Completely mesmerizing. Glad to see your a fellow FMJ fan. That movie is great, one of the best war pictures ever made. Stanley Kubrick’s Full Metal Jacket. Amazing first 40 minutes – then they get to Vietnam and the plot spins out of control to a pointless halt. That seems to be a common choice. I do love it, even though it’s not my favorite Kubrick movie. Thanks for commenting. Andy Sidaris: Return to Savage Beach. Just didn’t have the magic of his earlier works, which is a real shame because it was his final picture. Hmm, I haven’t seen that one. Thanks for commenting. Love Tarantino but wasn’t blown away with Jackie Brown. Yeah, I’ve always felt Jackie Brown was one of Tarantino’s weaker movies, though I do like it. Thanks for commenting. Christopher Nolan is one of my favourite directors and it would have to be ‘Following’ that;s my least favourite of his movies. Yeah, I’d probably say it’s one of Nolan’s weakest movies as well. Thanks for commenting. I’ll always love Cameron Crowe because of Almost Famous, but everything he’s done since that has been a bit meh really. Oh yeah, Crowe’s had a really rough time in the past decade. Thanks for commenting. “Curley Sue” by John Hughes.